Gas Lantern Media | audio, video and words in review: Notable Text: Eleven Kinds of Awesomeness. There are spoilers coming for any of you who participate in the Puma Book Club, but not the "Nate's-gonna-ruin-the-story-like-a-big-jerk" kind, just the "Nate's-gonna-give-away-some-thoughts-on-the-book-in-advance" kind. Richard Yates is famous to this recent generation as the old gent who wrote the book Revolutionary Road, starring Leonardo DiCaprio and Kate "Perpetual Hotness" Winslet. See, but before they made it into a movie, it was a book, which is like a Kindle, but with tree parts. 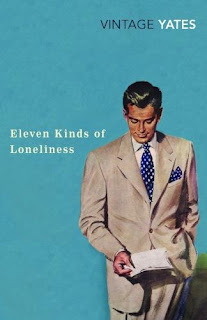 And after writing Revolutionary Road in 1961, Yates followed with a collection of short stories in 1962 called Eleven Kinds of Loneliness. As math, and planning would have it, there are 11 stories in the collection, and each addresses loneliness in a unique way. Consider that "loneliness" conceptually is usually something we consider individual. Being lonely is about being alone. About me being alone. But really, there are ways to be lonely even with other people around; surrounded with friends, and even with everything in life ostensibly successful. Loneliness, Yates shows, can be as simple as feeling a lack of control over a decent life. Yates taps into his patented 1950s failing American Dream concept with the same brilliant richness as his first novel, but in this case addresses his protagonists (sometimes each their own antagonist) as if they are photographs beneath a microscope. Each vignette comes to craft carefully, with vivid description and lively, never wasteful dialogue. The characters, as sometimes plain as they are, breathe and move with a vivacious accessibility that makes them impossible to ignore. And Yates succeeds greatly in allowing/showing us how to love secondary characters while his protagonists and narrators deride and ridicule them. He commands a reader's emotions like the colors on his palette as each venture into a new character's world brings us reflections on our own successes, failures, hopes and dreams. Very often the writing is naive, cute, or simple, but never without proper effect or by accident. It's always delicate. And it's often heartbreaking. Entirely. Tangibly. In a time in writing where the emotional is dedicated to romance novels, "chick-lit," and young adult stories about Mormon vampires, reading Yates' straightforward take on life (even if it was life in the '50s, written in the '60s) is refreshing. Being a character driven collection means it never feels dated or stuck in a time space. Eleven Kinds of Loneliness brings out the best and the worst in each character. Which is exactly what makes them so real, and so easy to embrace. While we love reading about morally absolute characters, those great heroes and villains battling over concepts of freedom, love and justice, we're never quite so taken in by them as we are by our friends and loved ones. Yates greatest success is that he creates people, real people, and lets his readers follow them through some of their darkest moments. And through being by his characters' sides, we can empathize and assuage some of that loneliness, just as Yates does for us. Favorite story: "No Pain Whatsoever" for the power it imparts to silences, and the sadness in necessary things left unsaid.